This set of nails is one of those sets that no matter how hard you try to capture the beauty of them, the photo just never does it justice. I promise you, they're absolutely gorgeous in person. 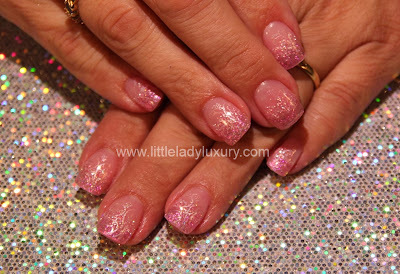 This is a simple glitter fade with Light Elegance's Pink Diamond glitter gel and Sugar Coated glitter gel. Two really really pretty pink shimmers. They were finished off with the clear builder gel and then a stamped image of silver bubbles (which really dont show up in the picture but just add a little glitz in person). All in all, a really easy set of nails to do, but with glam results :) Thanks so much Julie for letting me create these for you!